An eight member Community Reference Group of local Uralla residents and business owners has delivered a list of projects and local initiatives for funding by UPC Renewables Australia, as part of the New England Solar Farm project located about six kilometres east of Uralla. 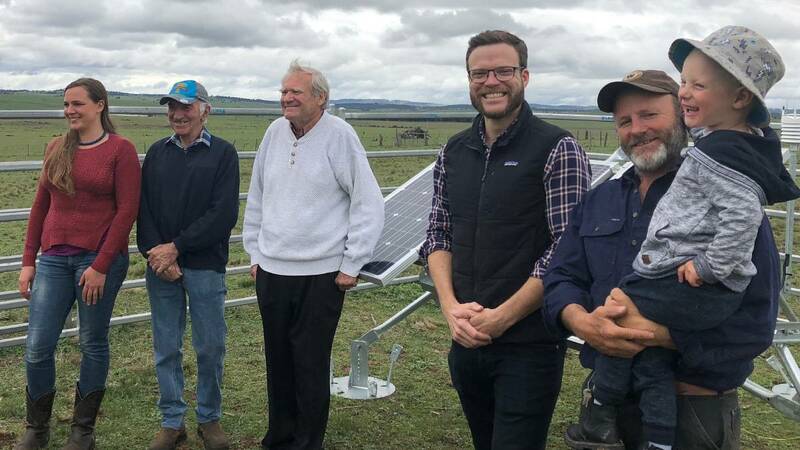 (l-r) From the Community Power Agency Jarrah Hicks, landowner Peter Munsie, Community Reference Group member Tom O’Connor, UPC Renewables head of solar development Killian Wentrup and Richard and Asher Munsie. UPC will support community projects through its Community Benefit Sharing Initiative by providing funding of $250 for every megawatt of power generating capacity installed at the farm, or about $150,000 and $200,000 a year across the 25-year working life of the farm. The reference group was established in August this year and independently chaired by the Community Power Agency, a not-for-profit specialist in working with local communities and renewable energy projects. UPC Renewables head of solar development Killian Wentrup said the company would to be involved in the ownership and operation of the project for the long-term, and had engaged with the community for the last nine-months. He said the sharing initiative was based on the principle that the Uralla community should also benefit from hosting solar developments. “It is important to us that the New England Solar Farm contributes to the local economy and becomes a valued long-term part of the Uralla community,” Mr Wentrup said. The group recommended projects such as a no interest loan scheme for energy efficiency measures, funding for education scholarships and schools as well as a community grants program. “It’s been a valuable exercise for us to work so closely with local residents, businesses and the council on this initiative. We hope there continues to be strong community involvement with the next phase of the initiative,” Mr Wentrup said. He said each project would need to undergo a feasibility assessment before receiving funding. The Development Application for the New England Solar Farm is expected to be submitted to the NSW Department of Planning and Environment in November, and if approved, the 600-800MW project is expected to produce enough renewable electricity to power more than 250,000 typical NSW homes.